Home » Assam Govt. Jobs » Tezpur Medical College & Hospital (TMCH) Jobs, Accountant, Cashier, LDA, Library Assistant etc. 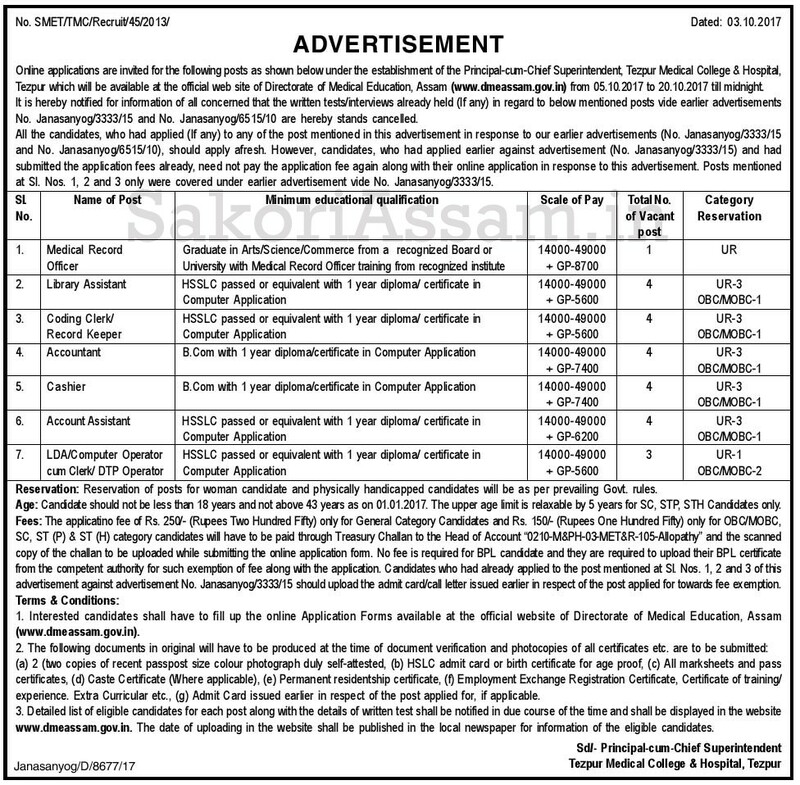 Tezpur Medical College & Hospital (TMCH) Jobs, Accountant, Cashier, LDA, Library Assistant etc. to 20.10.2017 till midnight. It is hereby notified for information of all concerned that the written tests/ interviews already held (if any) in regard to below mentioned posts vide earlier advertisement No. Janasanyog/3333/15 and No. Janasanyog/6515/10 are hereby stands cancelled. All the candidates, who had applied (if any) to any of the post mentioned in this advertisement in response to the earlier advertisement (No. Janasanyog/3333/15 and No Janasanyog/6515/10), should apply afresh. However, candidates, who had applied earlier against advertisement (No. Janasanyog/333/15) and had submitted the application fee already, need not pay the application fee again along with their online application response to this advertisement. Posts mentioned at Sl Nos. 1, 2 and 3 only were covered under earlier advertisement vide No. Janasanyog/3333/15. 1. Name of Post: Medical Record Officer. Educational Qualification: B.Com with 1 year diploma/ certificate in Computer Application. Reservation: Reservation of posts for woman candidates and physically handicapped candidates will be as per prevailing Govt. rules. c) No fee is required for BPL candidates. 1. Interested candidates shall have to fill up the online Application Forms available at the official website of Directorate of Medical Education, Assam (www.dmeassam.gov.in). a) 2 (two) copies of recent passport size colour photograph duly self-attested. c) All marksheets and pass certificates. f) Employment Exchange Registration Certificate, Certificate of training/ experience, Extra Curricular etc. 3. Detailed list of eligible candidates for each post long with the details written test shall be notified in due course of the time and shall be displayed in the website www.dmeassam.gov.in. The date of uploading in the website shall be published in the local newspaper for information of the eligible candidates.